CANBERRA, Australia — Australia's ruling party on Monday rejected a push to allow lawmakers to decide whether the country should recognize gay marriage, continuing a bitter political stalemate over the divisive reform. "It's time for the party to put the matter to rest once and for all," Smith told reporters before the meeting. But a crisis meeting of Liberal lawmakers decided to try again to persuade the Senate to endorse the plebiscite before Parliament considers voting on legislation. The rejected plebiscite bill will be reintroduced to the Senate this week. Voting on the plebiscite would be compulsory and failure to vote would be punishable by a fine. If the Senate again rejected it, the party would propose a voluntary postal plebiscite in which voters mail in their opinions instead of using ballot boxes as a cheaper option that would not need the Senate to approve the expense. The seven lawmakers who spoke against the plebiscite at the meeting were outnumbered more than three-to-one by 27 colleagues who supported the 2-year-old policy. Finding policy agreement on the issue is a test of Prime Minister Malcolm Turnbull's authority over his fragile government, which holds a single-seat majority in the House of Representatives. Lawmaker Andrew Broad had threatened to quit that government and predicted 16 of his colleagues in the Nationals party would follow if the Liberal Party opted to allow a parliamentary vote on gay marriage without a plebiscite. "It won't be me only, the whole show would blow up," Broad told the Sunraysia Daily newspaper. "So suddenly you'd lose 16 lower house members in one bloc. Turnbull's leadership would become untenable and he'd no longer be prime minister," Broad added. Gay marriage campaigner Anna Brown said she had legal advice that the government could not conduct a postal plebiscite without Senate approval. She said her advocacy group The Equality Campaign would seek a High Court injunction to prevent any postal plebiscite. "The government needs to think very carefully before it expends up to AU$100 million of taxpayer dollars when it could resolve this issue in Parliament as soon as this week," Brown said. 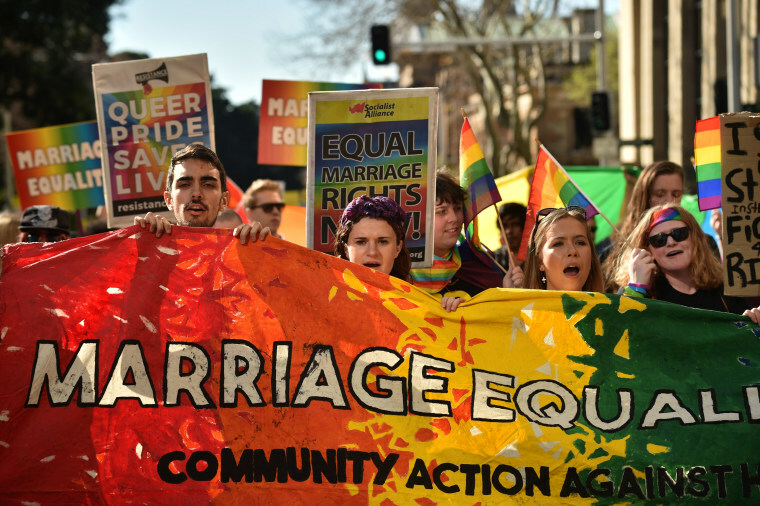 Opinion polls show most Australians support gay marriage. But most of that support is soft, and gay-rights advocates are concerned that referendums rarely change the status quo in Australia.